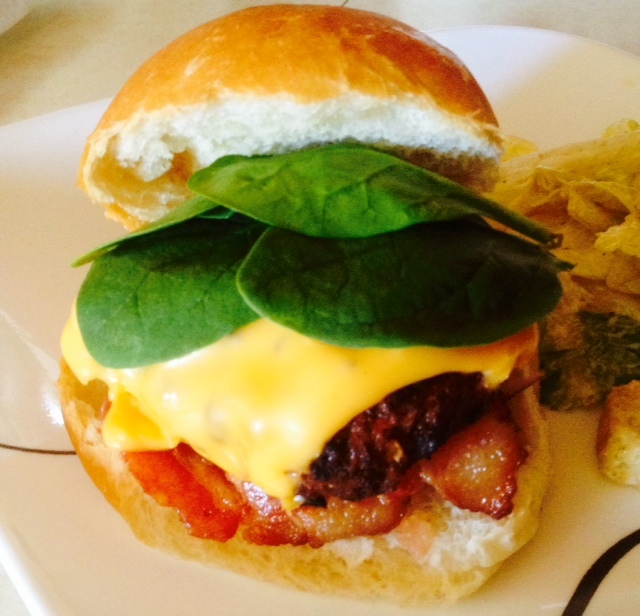 I know you can barely see it between the thick layer of gooey cheese, the fresh spinach, the crispy bacon and that super soft bakery bun, but underneath all of that wonderful stuff is the best, juiciest homemade burger patty ever. This burger is my Main Taste Tester’s creation. He is a bit of a burger aficionada so you should trust him. The first time he made them was for a barbecue last Father’s Day. We were brainstorming about ways to make a really juicy, flavorful patty and Tom decided to add Vegetable Thins crumbs instead of regular crackers, thinking they would add great flavor. They did, and everyone talked about them for weeks after. We have made a few more tweaks and these burgers were the star of our first barbecue of 2014. Super simple and so much better than store-bought. Mix all ingredients except egg and crackers. Let mixture marinate, covered, overnight. Before you are ready to cook, mix in crackers and egg until combined well. Form into patties and using your thumb, push an indent into the center of each patty. This will help them cook more evenly. Cook as desired. These are the best barbecued!